I always see on TV shows about steak sandwich and this is the best this and that. 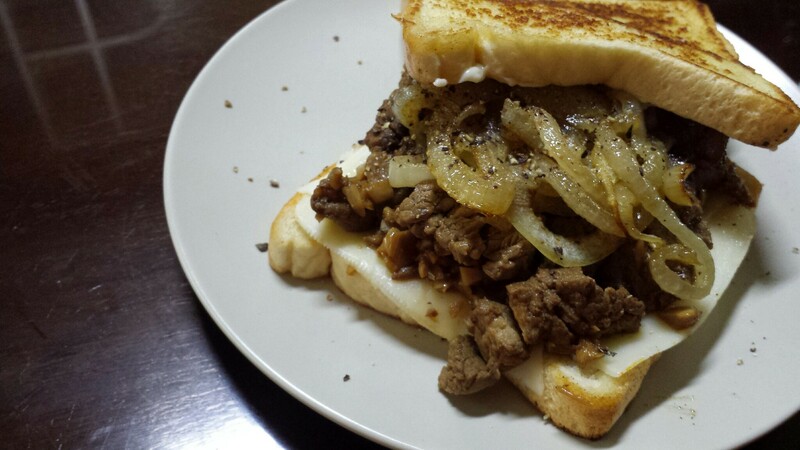 I have tried a steak sandwich. How can you go wrong with steak?! Haha. But I finally tried my own. The only catch was I didn’t have any other bread except for white bread that I really don’t usually enjoy. But it was lunch time, and I was hungry. I still have some cooked beef tenderloin leftover from salpicao. Salpicao is basically a quick stir-fry of tender beef, with garlic, soy sauce, worcestershire sauce and a bit of butter. So it’s basically smaller pieces of steak anyway. I looked up recipes and just worked quickly from that point on. First was the onions, which take the longest to cook. I sauteed them and let them wilt with some butter and olive oil, seasoned with a bit of salt. While this was cooking, I buttered both sides of two slices of bread. After removing the now softened onions, I placed the bread on the same pan, toasting it on both sides. While I reheat the salpicao in the same pan, I place slices of cheese (semi-curado lonchas) on one side, and mayo and mustard on the other side. Once the salpicao was heated through, I place it on the chopping board and cut it into smaller pieces. 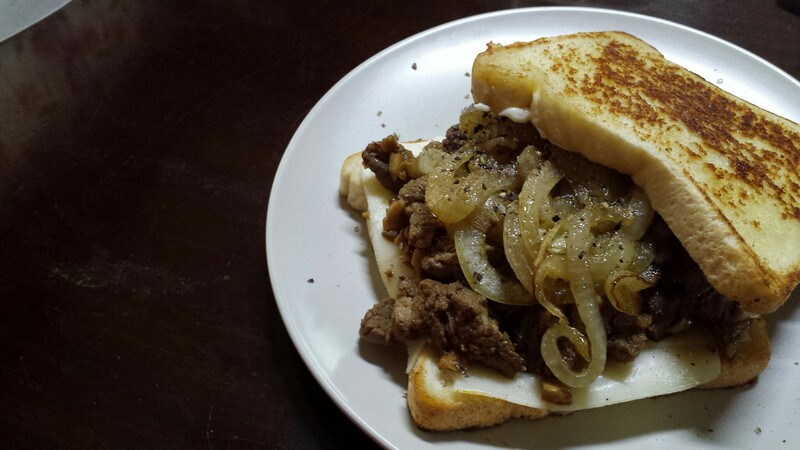 I then place it on the sandwich, then top with the onions. Cracked a bit of black pepper, and topped with the other slice of bread. Look at that great bread! Cook and sweat down the sliced onions in a pan, adding butter and oil as needed. Season lightly with salt and pepper. They should be wilted and sweet. Set aside. Butter the bread on both sides and toast in the same pan until golden. Remove from heat. Placed slice cheese on one side, then spread a thin layer of mustard and mayo on the other bread.